Without ceremony, electric tram services commenced in Hobart on 21 September 1893, the first successful electric tramway system in the southern hemisphere. It had several unique features: iIt was the only Australian system to use double deck trams a standard vehicles; it was the first street tramway on a rail gauge of 3'6" in Australia and survived to be the last; its use of bow current collectors throughout its life was unique in Australia; in 1949 it became the first tramway system in the world to use automatic conversion of AC to DC power supply. The system was at first operated by the construction contractor, Siemens Bros of Britain. In 1894, the Hobart Electric Tramway Company Ltd took over operations and continued until the Hobart City Council assumed ownership in 1913. Following a controversy over fare levels, the state government vested operation in the Metropolitan Transport Trust in 1955. There were three original routes: from the railway station to Cascades, and from the General Post Office to Sandy Bay and to Moonah. Totalling about ten miles, they were serviced by a fleet of twenty double deck trams. The depot and steam power station were located in Lower Macquarie Street. (In 1924 a second depot opened in Moonah.) Later routes served West Hobart, North Hobart (Letitia Street), Lenah Valley, Proctor's Road and Springfield. The Moonah route was extended to Glenorchy in 1931. New trams were built at the depot, the last double decker appearing in 1925. Single deck cars, both four wheeled and double bogie (eight wheels) were also used. Following three derailments in which double deck cars overturned, the 31 remaining such cars were cut down to single deckers, beginning in 1948. The maximum route mileage attained was17 in 1934–42. The greatest fleet size was 75 trams, in 1946. On 29 April 1960, the worst accident on the system occurred when a runaway tram collided with a following tram in the city centre. This resulted in a number of serious injuries and the death of the conductor, Raymond Donohue, who was posthumously awarded the George Cross for his bravery in attempting to stop the tram and warning passengers and following traffic. 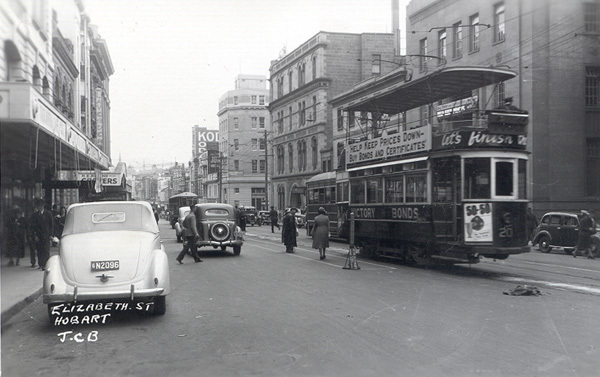 Beginning in 1942 with the Cascades route, trams were gradually replaced with electric trolley buses on the southern side of the city. Subsequent tramline closures were in favour of motor bus operation and the last tram route, to Springfield, closed in October 1960. The only surviving complete Hobart tram, no 141, is on display at the Tasmanian Transport Museum, Glenorchy, with the restored body of double decker no 46. Launceston's tramways were constructed by the City's Council, employing contractors, chiefly J&T Gunn Ltd. The tramways were powered by the pioneering Duck Reach Hydro-Electric power station and were owned and operated throughout their life by the Council. The opening ceremony was on 16 August 1911, in Brisbane Street, when six trams carried invited guests over the inaugural routes to King's Bridge, Newstead and Mowbray. In October a fourth route, to Sandhill, opened. The trams were attractive single deck vehicles with enclosed saloons and open sections, painted maroon and yellow, outlined in gold. The fleet grew to 29 vehicles, the last three being large double bogie trams which were very popular. Most of the original fourteen trams lasted the life of the system. Apart from extensions of the 1911 routes, to Trevallyn, Wentworth Street, Mowbray Heights and Carr Villa Cemetery, later routes served High Street, Basin Road and King's Wharf. The first depot, in Invermay Road, survives as a convention centre, having been abandoned by the tramways in favour of a new depot in Howick Street following the 1929 flood. The Howick Street premises continue in use today as the city's bus depot. As with other provincial tramways, Launceston's size scarcely justified the cost of construction and operation. However, in 1911 trams were the only available mechanised street transport. Low patronage, combined with the age of the equipment, led to the Council to replace the system with electric trolley buses in 1952. The official 'last tram' no 1, returned to the depot on 13 December,1952. Tram no 16, now diesel powered, runs as an attraction at Penny Royal World, bogie car no 29 has been restored and is displayed at Inveresk, and the body of no 11 has been cleverly incorporated into the 'Tram Bar' at the Great Northern Hotel. The restored body of no 13 is displayed at the Tasmanian Transport Museum. Further reading: IG Cooper, Hobart Tramways, A Centenary Commemorative Review, Sydney, 1993; J Richardson and IG Cooper (eds), Destination GPO, Canberra, 1971; J Chesworth, I Cooper, P James and J Stokes, The Electric Tramways of Hobart, Sydney, 1960; R Proctor, Launceston Municipal Tramways, Launceston, 1993.